Hundreds of IDF soldiers from infantry and tanks celebrate finishing tractate at their swearing in ceremony. Hundreds of IDF soldiers celebrated the finishing two Talmudic tractates at their swearing-in ceremony on Sunday. The twin celebrations were at the Western Wall, where the Kfir Brigade was sworn in, while the tankers held their ceremony at the "Yad Lebanim" tank museum in Latrun. The soldiers, many of which study in the Hesder program, had divided up the pages of the Rosh Hashana and Mo'ed Katan tractates in order to finish it before their swearing in. 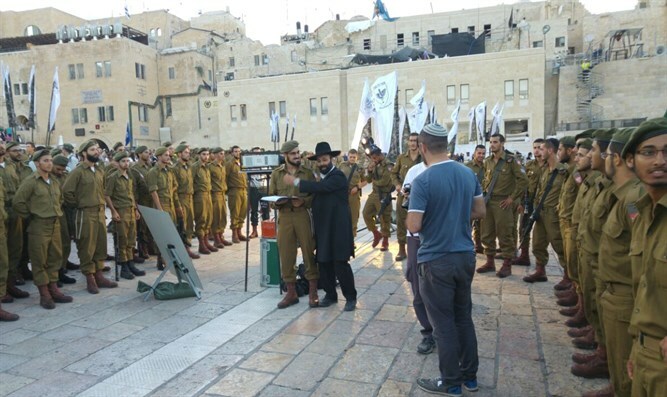 The study and the festivities are part of an initiative of the organization Tzalash - "Army for the Name of Heaven," which accompanies the religious soldiers in the IDF. As part of its efforts to provide spiritual guidance to IDF soldiers, Tzalash is printing a special edition of the with the Talmud with 'V'Shinantam' commentary, which is tailored to the pocket of the uniform, and makes sure to distribute it to soldiers. To date, more than 700 tractates have been finished in various bases and outposts. Rabbi Peretz Einhorn, the chairman of the Tzlach organization, said, "Lucky are the soldiers, Blessed are the State who these are its supporters and those responsible for its preservation. Happy are the rabbis." "Thousands of soldiers hold the Gemara throughout their military service, and as such they are also more professional and motivated soldiers and are happy to continue their wonderful mission," added Rabbi Einhorn.